Dots up and out! 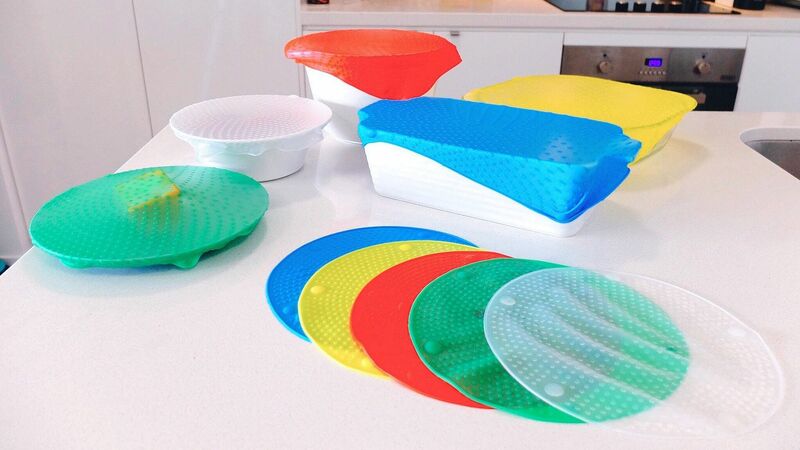 In an assortment of fun colors, Food Guard Lids are an eco-friendly way to store your food. No more wasteful single-use plastic wrap or searching to find the right sized container and lid. These are food grade silicone rounds with a bit of stickiness that are so handy to cover your food whether it’s in a bowl, on a plate, in a container, or in a pot or pan. One side has dots or bumps, making it easy to identify which side faces out. Just gently stretch the round over your container (they can be stretched 2-3 times their size); it grips the edges and creates an airtight seal. The seal is strong enough to allow you to stack something on top of it! Safe to go from the fridge to the oven or microwave, they can even be used in the freezer and still hold their seal. They are reusable and hand or dishwasher safe. Food Guard is the lid that fits any container and saves you time and money, as well as being good for the environment!